Getting the proper nutrition to your potatoes is an essential element in maximizing your crop’s quality and yield. There are 17 essential nutrients necessary for plants to complete their growth cycle. Three – carbon, oxygen and hydrogen – are supplied primarily through air and water. The remaining 14 come primarily from soil and inputs. Nutrients can be added to the soil in a number of ways, from soil amendments such as manure or compost to commercial fertilizer. The three primary macronutrients are nitrogen, phosphorus and potassium. Secondary macronutrients are sulfur, calcium and magnesium. There are a number of factors that determine how much of each nutrient should be applied to your crop: Yield potential, variety, remaining nutrients in the soil, previous crop residues, amount and types of soil amendments, soil type, pathogen pressure and previous year’s crop. The nitrogen demands of an early-maturing cultivar, such as a Russet Norkotah, vary from a later-maturing cultivar such as a Russet Burbank. Check the nutrient management guidelines for individual cultivars; don’t assume all potatoes require the same nutrient schedule. There are five stages of tuber development: 1) sprout development; 2) vegetative growth; 3) tuber initiation; 4) tuber bulking; 5) maturation. According to an article by Jeff Stark, Dale Westermann and Bryan Hopkins, cumulative nutrient uptake curves for a potato crop follow an s-shaped pattern. Uptake curves for most major nutrients follow the stages of tuber development, with rates increasing during bulking and then leveling off at maturation. In Wisconsin’s central sands region, the major problem facing growers is keeping the nitrogen in the soil during the growing season. Soil scientist Matt Ruark, an assistant professor at the University of Wisconsin/Madison, said that growers sample petioles from plants for nitrate levels. Based on the concentration of nitrates, they can identify if the plant is deficient in nitrogen and if fertigation would be beneficial. Ruark said the ideal fertilization system would apply the recommended rate of fertilizer over two or three applications, starting at emergence and through tuberization. Over the past three years, Ruark has been conducting field trials on controlled-release fertilizers and enzyme inhibitors that would “protect” the nitrogen early in the season, thereby keeping the nitrogen in reserve for when the tubers require nutrients during the bulking stage. Ruark has put another product, Super U by Agrotain, through field trials. The product contains a urease inhibitor and nitrification inhibitor. According to Ruark, both ESN and Super U have significantly reduced nitrate leaching during the growing season, but they’ve only done one trial with Super U and they are continuing to develop recommendations for optimal application timing. Oregon State University’s Don Hornek, a soil fertility specialist and Extension agronomist at the Hermiston Agricultural Research & Extension Center, warns growers that when applying urea you must factor in environmental conditions to maximize effective use of the fertilizer. 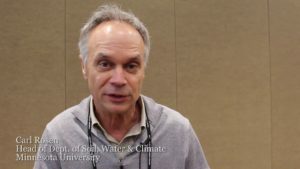 During his presentation at the Washington/Oregon Potato Conference, Hornek said that when applying urea during warm temperatures, you are more likely to lose nitrogen to the air, a process called volatilization. Volatilization also occurs when the urea is applied on wet soil through transpiration, and even crop residue can promote volatilization. Volatilization occurs when the urea comes in contact with moisture and urease, a naturally occurring enzyme in the soil and crop residue that breaks down urea and releases it as ammonia into the air. If using urea fertilizer, Hornek advocates mixing the urea with Agrotain to reduce the loss of urea into the atmosphere. Another method of reducing urea loss is to apply about a half inch of irrigation water following a urea application. Hornek said this would reduce the ammonia volatilization from 60 percent to 5 percent. “Put the fertilizer out and immediately irrigate,” Hornek said. He said rainfall is not as effective as water from an irrigation system you can control and monitor.